Happiness is a funny thing, isn’t it? Sometimes it feels like you have to work so much harder for it than other feelings. Like being worried, upset, sad or hungover. They all seem to happen pretty effortlessly. But happiness requires a whole lot of hard work sometimes. Poor old Oscar – and the poor old nightingale. It’s a great story. And there’s a certain truth in it about never being quite satisfied with what you have (or where you are), and always seeking something else in the name of happiness. Anyway, in an effort to remind myself that Things Are Not All That Bad, and that I have lots of things to be happy about, I figured that keeping a note of the good things would be a good start. I’ve seen people all over social media taking part in 100 Happy Days and while my first reaction, if I’m honest was to roll my eyes a bit, I did find that reading them made me smile. So maybe there’s something to it. Well, I never. Why isn’t everyone doing this?! Well, that’s a bit of a pain, isn’t it? I’d already planned on making you all sick with jealousy with photos of myself standing in the lashing rain at GAA games or covered in muck half way up a mountain in Mayo, but I guess I’ll just have to rein that in, won’t I? And incidentally, if it’s not a competition, how can you cheat in it? Hmm. Anyway, skepticism and semantics aside, I’m going to give it a shot. If nothing else, it will be a good exercise in discipline. I’m a crap photographer though, so if you’re expecting anything visually spectacular, you’re in for a disappointment. 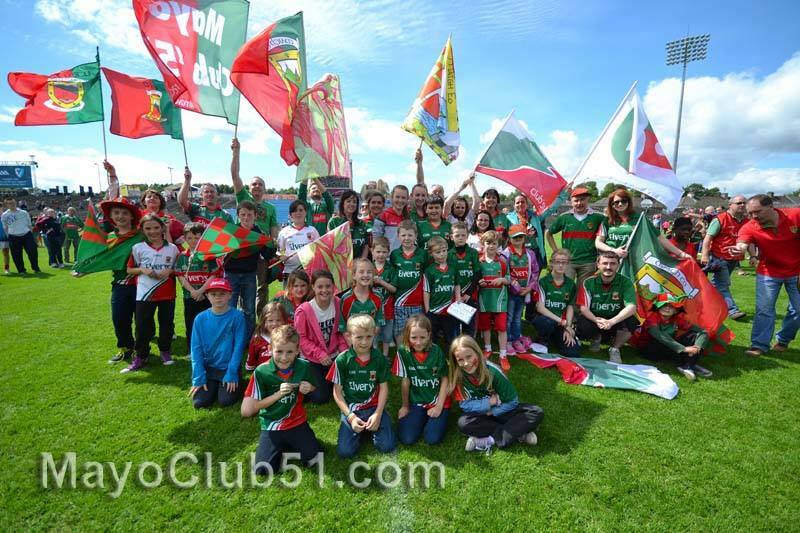 From last Sunday, inMacHale Park,Castlebar, after the Mayo senior football team had just won their fourth Connacht title in a row.There’s a lovely sense of togetherness that comes with being a GAA supporter. While I adore the sport itself, it’s the joy of the shared experience that gets me every time, even when the result doesn’t go your way. But Sunday was one of those days when it did – the sun was shining, the flags were flying and everyone was smiling. In Mayo, we so desperately want to win the big one, that it’s easy to take lovely days like this for granted. And there’s another lesson right there. We’ll all be hoping for a few of these days over the coming months, but this one will keep us smiling for a week at least. I had not heard of this #100days thing. Thanks for pointing it out, go you. The problem is -even if i manage 100 happy days- i won’t be online hundred days in a row. I don’t think that really matters. I already know I won’t manage 100 in a row (real life will happily get in the way), but if I get to 100, that’ll be an achievement in itself. Yours was one of the ones that made me smile Limmster – I’m blaming you for this! 😉 Thank you – looking forward to it! Good stuff, Anne-Marie, looking forward to it. I’m basically the same with the rolling of the eyes at first, but I do find myself enjoying other people’s moments from time to time. And anyway, I roll my eyes at everything the first time; I’m surprised my retinas haven’t detached. You and me both. But life’s too short to be a cynic ALL the time, so for five minutes per day from now on I’m going to not be one.